Box of Rain Quilt Finished!! Thanks so much for continuing to support and check in. 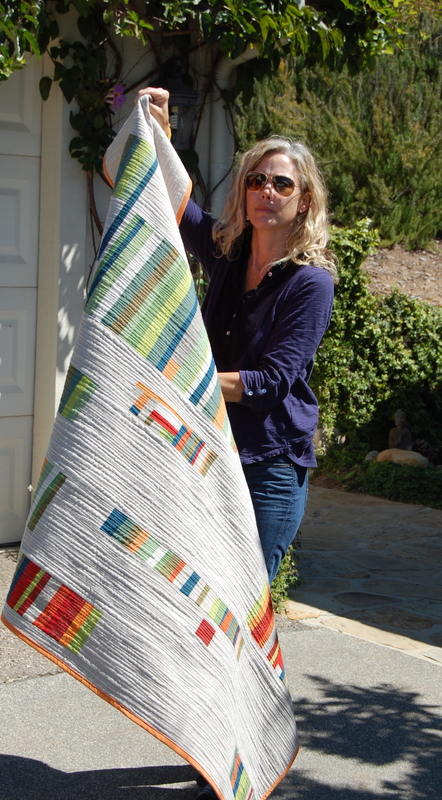 Sharing the process with you all turned out to be such a rewarding and fun way to create a quilt. You guys are the best!! some Kaffe Fasset shot cotton for both the binding and the back, and lastly, what seemed like a boatload of Aurifil thread in linen! As for the batting, I used Quilter’s Dream, which is so very nice to work with, light weight and soft. I do wonder however if Warm & Natural would have been a better choice for this project. It seems to be a bit stiffer to hold the shape more consistently? Not sure yet about that one……I just didn’t want the quilt to get too heavy! The Box of Rain Quilt finished at about 66 x 55 inches and fits just right on my new wall hanging system. The Oakshott cottons were soooo great to work with. It was first experience with them and I’ll definitely be investing in more. I kept thinking, as I was working with them that they seemed a bit like a silk, so exotic and luxurious!! The Robert Kaufman that I used for the backing and binding, also a shot cotton, is possibly the softest cotton I’ve ever felt, just perfect for the back of a quilt. I adore the color variation in it as well (sorry I don’t remember the name of the color). But really rich and beautiful! I had such fun making this quilt. I remember saying at one point during the process, “Gosh, I just love what can come of a a little creativity with fabric, and thread!” Ha, it’s the little things in life that get me excited, what can I say! I’m not sure where this quilt is destined to be, however, for now I’m so happy to have it hanging in my livingroom as a reminder of why I love designing and creating modern quilts so much. Thanks for sharing it with me! Hope you have a beautiful Earth Day weekend!! I know I will!! 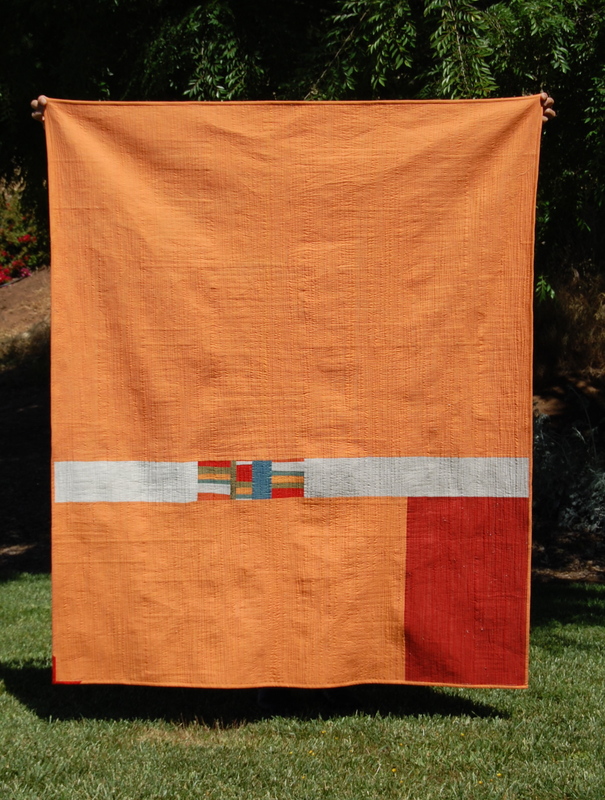 Love that orange in your quilt. It make it stand out. Thanks for sharing and congrats on your finish! It’s absolutely fabulous….I really enjoyed your progress posts. Another beauty Karen! I love how you decided to quilt it and what you came up with for the back too. Yum. Just amazing…..I just love it. SUPER gorgeous quilt! It was so fun watching this one come to life and it is ever more gorgeous than I thought it was going to be! Congrats on finishing it! I hope you enjoy it!! Lets just chat for a minute about how gorgeous this is shall we? The placement of the blocks, the background, and that quilting!!! Perfect in every way. Did you mark any of the lines at all to keep from slanting, or is it totally ‘organic’. I’m thinking for my next quilt…..
Ha, Carla, you make me laugh!! Thanks so much! I did not mark out any lines, but I started from a vertical seam line close to the center and then tried to stay as parallel as possible based on that first line. They are definitely organic and very “forgiving”! I’m smiling at the lovely pictures of your even lovelier quilt. I’m sharing in your excitement about an amazing finish, because it’s so wonderfully satisfying! A stellar accomplishment in spite of sewing machine trouble. I’m looking forward to hearing how you got through it. Congrats! Wowza, way to go! It came out so beautiful! It’s been such a pleasure watching the process of it coming together… thanks for sharing it with us! Just beatuiful. I love everything about it. 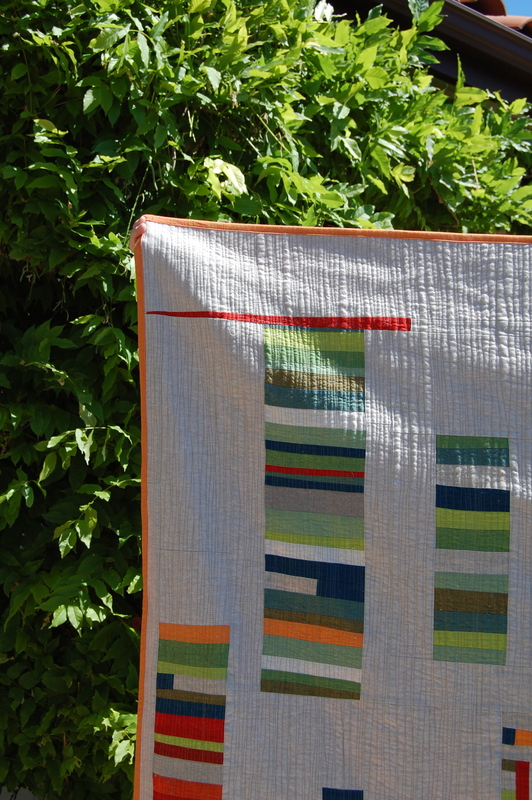 Question, what is the average width of your organic quilting? 3/4″? Thanks for sharing. Thanks so much, I would say the average width was about 1/2 actually, some of the lines are basically on top of each other, and the widest is probably 3/4ish! 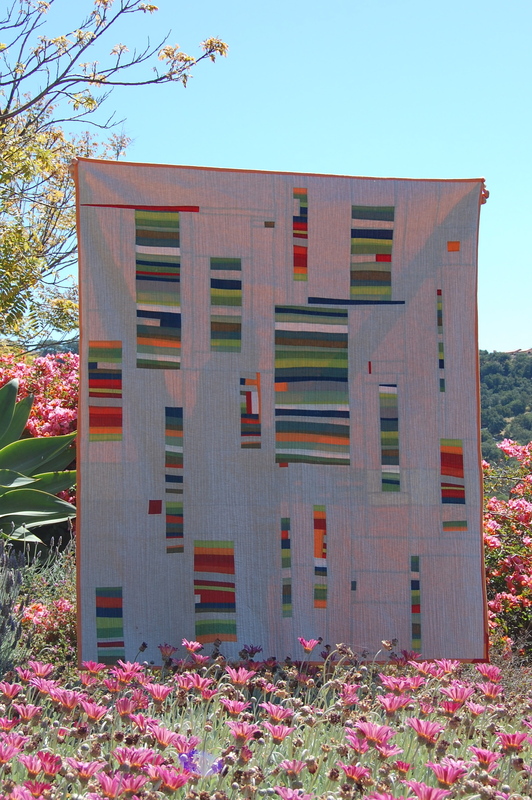 What color thread did you use for quilting? I used Aurafil in Linen! Love it! oh, wow!!!! It’s absolutely stunning. I just love everything about this quilt fabric, pattern, colors, and that quilting !!!!! WOW, I WANT THAT QUILT! I love modern and you did everything perfectly! i’m so glad you got it finished!!! it looks fantastic!!! 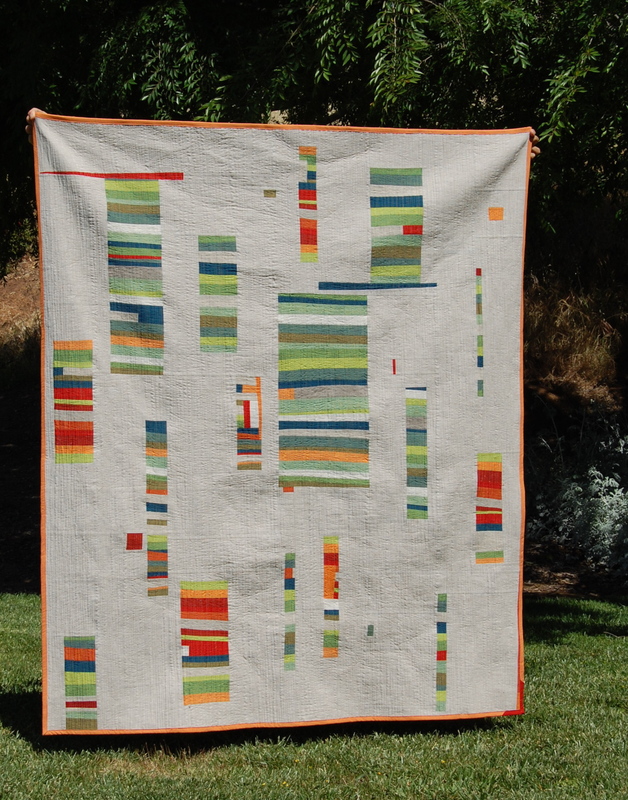 you’ve really showcased the oakshott so well in this quilt and although paralyzing to your back, the organic/straight lines are fabulous. how many hours do you think you spent quilting? i love the back, too… great colors and placement. It’s so beautiful and I love the orange binding. I too bought some OakShott Cotton at Quiltcon and I’m looking forward to cutting into it. I can definitely understand your excitement – it’s a beautiful quilt! Love this one! The colors and design are great and that quilting is amazing. I don’t know that I’d ever have the patience for that kind of quilting on anything larger than a pillow. I love this quilt. Great job Sis!!!!!!! Beautiful, Karen! And I love the back, too! (Ooh, that orange…) Gorgeous. Keep it hung up for a nice long time, as a feast for the eyes. And thanks for sharing all the progress posts; I so enjoy watching a quilt come to life, whether it’s mine or someone else’s. Love every bit of it! I bet it has a great weight to it. Karen, what a gorgeous quilt. It just draws me in! I love the colors and especially the one longer, red vertical line on the top right! Great job!!! 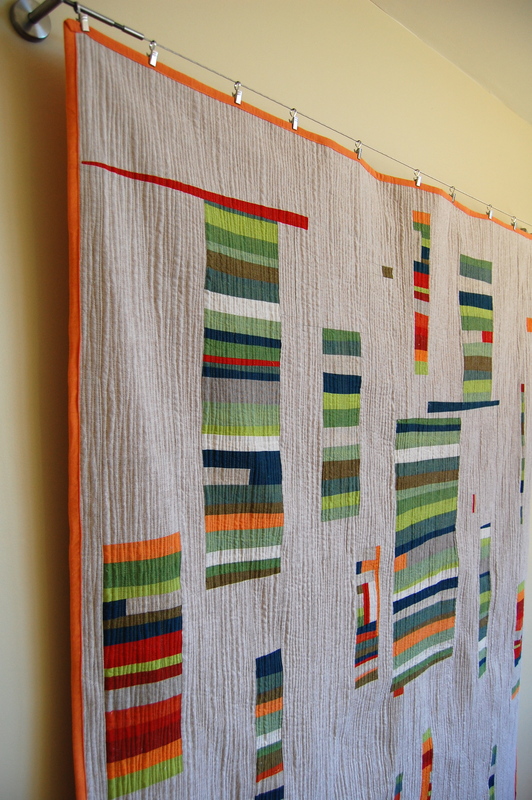 I love your quilt, and I love your hanging system, and I love your quilting lines. You have inspired me! this is so beautiful. 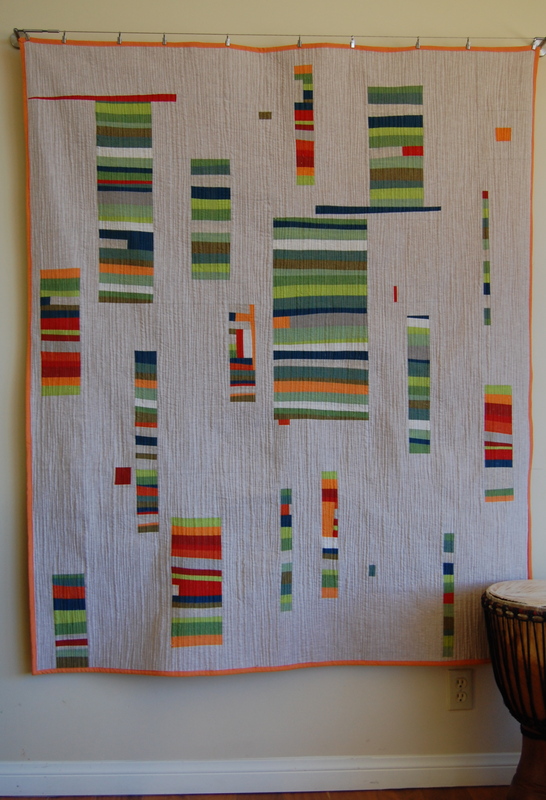 it has been a joy to watch you be so inspired that it bubbled over into this gorgeous quilt. It’s gorgeous, Karen! You achieved a nice balance in the composition, which I imagine is not easy to do with the negative space. And the quilting gives it such great texture. Well done, my friend! Thanks so much Irelle! Upon reading your comment I suddenly realize that I goofed in referring to the other Shott Cotton as a Robert Kaufman instead of Kaffe Fassett!! This is something I was well aware of, but just completley spaced out on when writing!! Sorry for the confusion. That looks so wonderful! I followed the entire time and I had so much fun seeing your progress on it. Thanks for sharing! 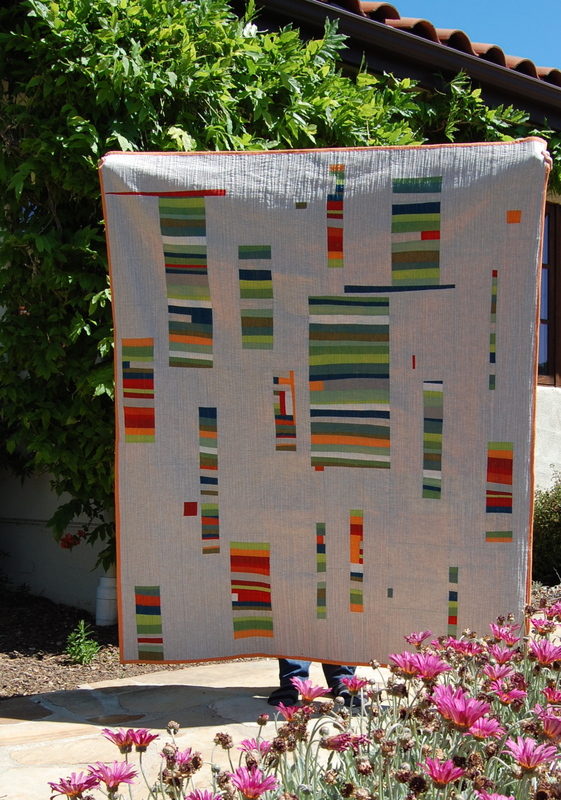 WOW, love the photos of this fun, organic, wild & colorful striped quilt. the quilting lines look very free form too, am i seeing that correctly? 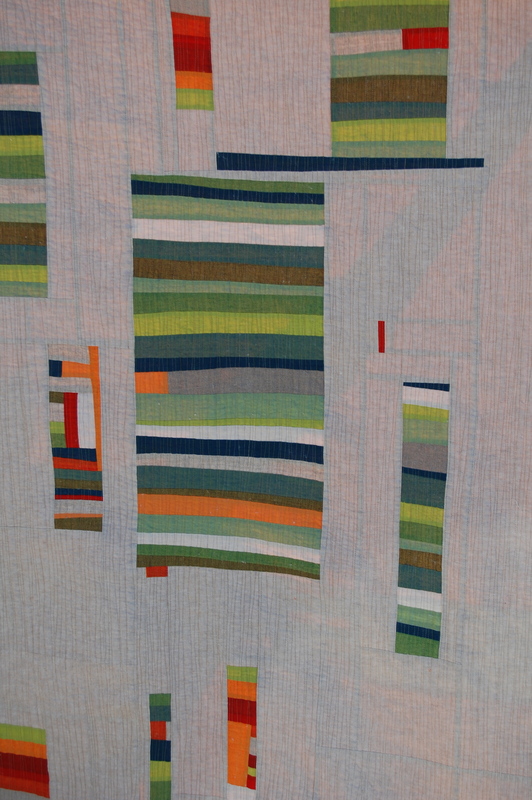 You are a true textile artist. thanks for sharing !